From the author of the popular Weather Warden series comes the debut of an exciting new series set in Morganville, Texas, where you would be well advised to avoid being out after dark. College freshman Claire Danvers has had enough of her nightmarish dorm situation. When Claire heads off-campus, the imposing old house where she finds a room may not be much better. Her new roommates don't show many signs of life, but they'll have Claire's back when the town's deepest secrets come crawling out, hungry for fresh blood. Will she be able to face the town's terror or will she drown like everyone else? My second time was reading Glass Houses by Rachel Caine, but my first time reviewing it. 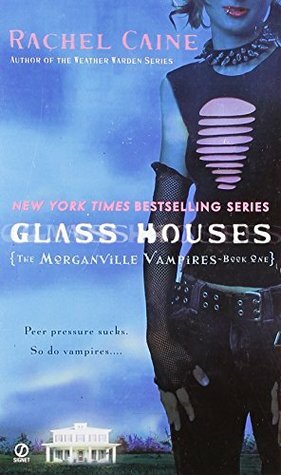 The Morganville Vampires happens to be one my favorite Young Adult Paranormal series that I had a hard time putting down back in 2009. I did the same thing again when reading Glass Houses. I finished reading it pretty quickly again. I’ve been wanting to re-read them because the last couple of books of the series I put on hold to read and now I have some catching up to do. Poor Claire she’s been bullied by a mean, cruel girl and only wants to get away before she ends up getting killed. I tried to take care of the bully girl for her throughout the book, but the bully girl finally got put in her place. In comes the idea of finding a place off campus from her college dorm room. She ends up visiting the Glass House that she read in the ad, where three other people live (Eve, Michael, and Shane) and are looking for a roommate. Each of them is complete opposites, but their friendship is fantastic. Claire needs some friends, and I’m so glad she met these three. It also helps to have two of them handsome in her life and all three protecting her. She ends up finding out what is happening in Morganville thanks to her new friends and roommates. Although Claire is going to get even more in trouble in the story, I won’t go into those details. I give this book 5 stars and look forward to diving back into the second book (re-read). I love this series, and I missed this world and its characters that Rachel created.